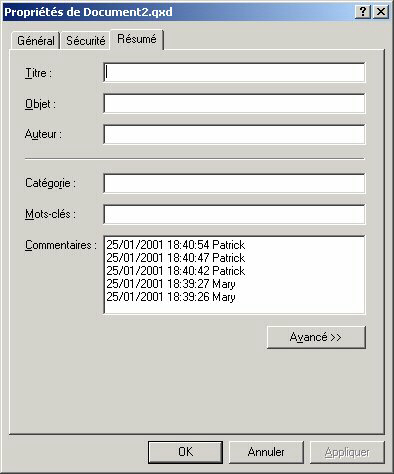 Put audit file modifications in Windows 2000 and Macintosh files comments. Are you having trouble keeping track of last users that modified a file? BriefAudit will be set up by network administrators to put this report about document changes history on comment file property for later auditing. BriefAudit audit software selects files changes events in NT4/NT2000 standard Security Log and writes the selected events in the corresponding Windows 2000 and/or Macintosh files comments field. Date and time of file modification, Modifier's identification. Once activated you will be able to ask: show me the last 3 dates when ThisFile has been updated, who did it ?. 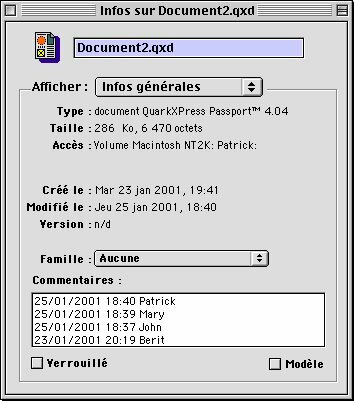 Just right click on the file ThisFile and select Properties [using Windows 2000 Explorer] or Command+I [using Macintosh finder]. Special promotion: SITE License for only 77$US ! lets you install it in all computers of your Company site. Can write the selected events information into the corresponding Macintosh files comments (on Windows NT 4.0/Windows 2000 running standard Services for Macintosh or MacServerIP or ExtremeZ-IP ). Fully preserves the content of files - only relevant comments streams are modified. The metadata information added to file property comments by BriefAudit can also be listed by other tools such Catalogue and SumInfos . Runs on Windows NT 4.0/Windows 2000 running standard audit policy -see below - (Audit policy not available on Windows 95/98/Me). How to enable auditing on certain files/directories ? How to activate Security Event Logging in Windows NT 4.0 ? How do I enable auditing ? How do I enable auditing on certain files/directories ? Where are the Security event ID's listed ? Windows NT audit policy can produce a huge amount of events in Security Log. BriefAudit reads the entire Security Log at regular time intervals. Set the size of the Security Log to an appropriate value and use 'wrapping to overwrite events as needed' management method. For information, Security Log stores roughly 3500 events / 1024 KB. For the same reason and because BriefAudit generates by itself reads/writes and audit events, limit auditing to specific useful directories. Trying to audit a full volume with thousands files very frequently accessed is not a good idea. Macintosh comments are limited to 200 chars and BriefAudit limits the length of Windows 2000 comments to 500 chars (by default; you can modify this value using the Configuration menu). Services for Macintosh (SFM) on NT uses internal indexes of opened volumes. But these indexes are not updated when comments are written for the first time by any other application than SFM. A Macintosh comment is only updated when a first comment already exists and has been written by a Macintosh station. To put it in other words, a user needing to 'comment-audit' a file must initialize the comment from a Macintosh. This is not the case for other Mac Servers on NT (MacServerIP and ExtremeZ-IP). Some applications rewrite completely the file when you save modifications. 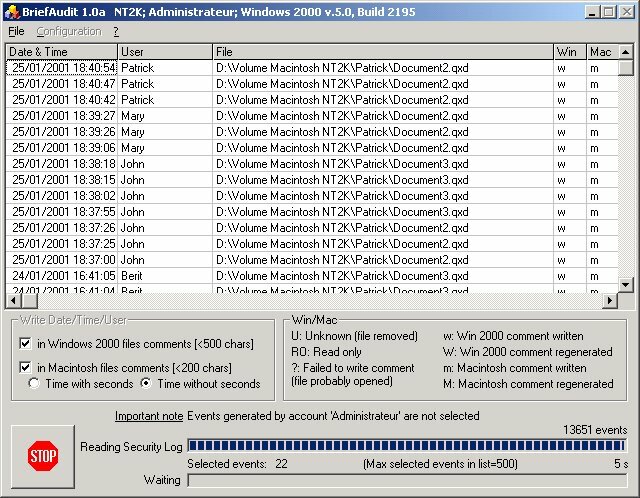 Windows 2000 and Macintosh comments are then lost and BriefAudit tries to regenerate audit comments using the list of events previously selected. However, it is not always possible. For example it is almost impossible to maintain correct audit for Microsoft Office documents! On the contrary, BriefAudit runs fine with Quark XPress documents. Just try it with your own files! To get a full trial version Download BriefAudit (2540 Kb) , and try it. You need to register to avoid periodic message box when comments are written. Buy BriefAudit Now using the secure server You will rapidly receive your activation key by e-mail. Price is 26 € ( 25 US $). For large number of licenses, please contact us for a quotation. Catalogue: for a quick list of document properties in a nice html format and export of metadata into csv, xml, word format file.